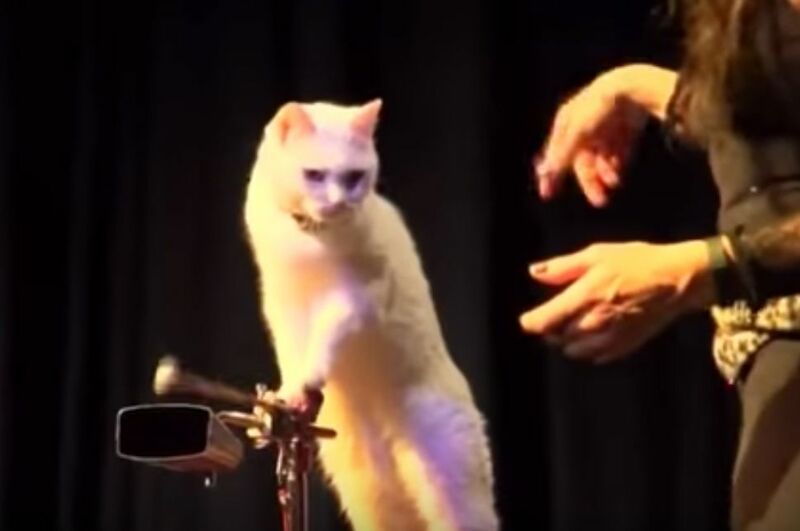 The Georgia-based troupe of (sort of) circus-trained house cats known as The Amazing Acro-Cats are coming back to San Francisco five years after their 2014 debut here. This posse of pussycats are playing shows at Fort Mason from May 1 to May 14, and there are still plenty of tickets available. Martin uses a clicker and treats to train the cats, and she says, "We use our show as an entertaining demonstration of what cats are really capable of, as well as the healthy benefits of clicker training." In addition to cat tricks, the act also features an all-cat band: The Rock-cats. The cats don't necessarily play the entire tune, but some have been trained to hit keyboard keys and, most notably, play the cowbell. Martin says that most of her cats are former rescues or strays, and that she's helped adopt out upwards of 140 cats through her Acro-Cats shows. Also, she says she typically donates a portion of the show's proceeds to cat rescue organizations. Tickets for the Fort Mason dates can be found here. But first, below, please enjoy the Acro-Cats' hilariously reluctant performance efforts on The Late Show with Stephen Colbert in 2015. You can't always get a cat to perform on command, clearly. But a few of them really pulled it off! The much anticipated pizzeria spinoff of Flour + Water is prepping for its opening according to a new job posting, which means Missionites and everyone else will soon have a more central spot wherein to carb load in high style.